18ct White Gold Eternity Ring Using the Customer’s Diamonds — Form Bespoke Jewellers Ltd.
A bespoke white gold eternity ring created using the customer’s diamonds. The customer came to us with a collection of diamonds that they already owned. 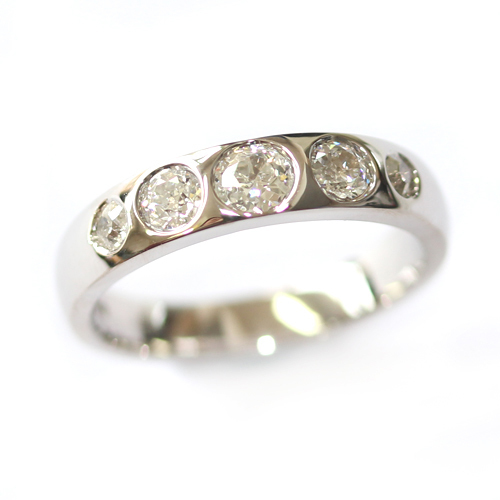 They were looking to have them re-designed into a bespoke eternity ring. This stunning design was created with the largest diamond at the centre. Then flanking it are the other four diamonds which decrease in size as they move down the shoulders of the band. All the diamonds are rub set by hand for a contemporary, tactile finish. The ring was also cast in 18ct white gold which beautifully complements the diamonds and the customer’s existing jewellery.